During the past 40 years, the United States has experienced a sharp and sustained rise in wage and income inequality. 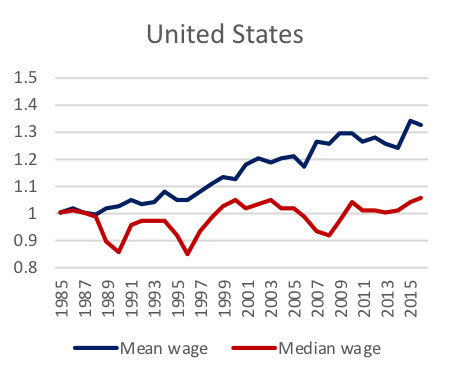 The high level of inequality in the United States reflects both a disconnect between (1) average wages and productivity, and (2) top and bottom wages. As shown in Figure 1, much of the growth in labor productivity has gone to growth in wages at the top of the distribution. Panel (A) of figure 1 shows the growing gap between median compensation and average productivity into the gap between capital and labor share, compensation inequality, and differential price growth for consumer and producer baskets. 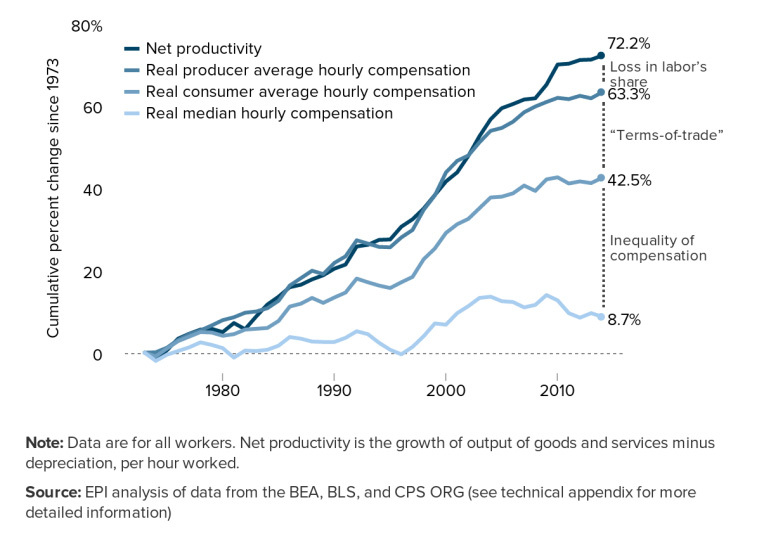 While net productivity grew by 72% between 1973 and 2014, over that period median real compensation grew only by 8%. Much of the gap between mean productivity and median compensation arises from growing inequality in the labor market that has grown steadily over this period, especially since 1980. This is reflected in the fact that mean compensation grew by around 43% over this period, much more than median. The pattern of inequality is also reflected in panel (B) which shows that the 90th percentile real wage grew by over 35 percent between 1973 and 2016, while the median and 10th percentile real wage grew by approximately 6 percent over the same period. While there are some divergences in the bottom of half of the wage distribution, they are small compared to the sizable and growing gap in pay between those at the top compared to the rest of the workforce. Finally, besides the inequality in wages, labor’s share itself has fallen since 2000, suggesting a smaller pie to be shared among wage earners. This likely puts additional downward pressure on wages. While globalization and technological change have likely played a role, a sizable body of evidence in economics suggests institutions have been important contributors to these trends as well—including collective bargaining and statutory minimum wages. The stagnation of the federal minimum wage since the 1980 contributed to real wage declines at the bottom (Autor et al. 2016), and the erosion of collective bargaining led to wage declines in the middle (Farber et al. 2018). Moreover, economic theory and evidence increasingly point to the importance of labor market power, suggesting that the laissez faire equilibrium without collective bargaining may be better understood as being monopsonistic rather than perfectly competitive to a first order approximation. Growing evidence suggests the importance of firm’s wage policies in explaining pay differences across workers (e.g., Song et al. 2018; Card et al. 2015). Recent evidence using matched employer-employee data suggests that around 20% of the variance in log wages is explained by firm specific factors. This is consistent with the older institutionalist tradition that highlighted “wage contours” (e.g., Dunlop 1957) – though it would probably be called “frictional wage inequality” today. It is also consistent with a large body of evidence that employers have substantial power to set wages without the ironclad discipline of labor market competition (Manning 2003). Recent work has provided high quality evidence on employers’ power to set wages in a range of sectors from retail to online platforms (e.g., Dube, Naidu, Jacobs and Suri 2018; Dube, Giuliano and Leonard 2018; Cauldwell and Oehlsen 2018). Moreover, there is evidence that the extent of concentration in a local labor market is correlated with the level of wages (Azar et al. 2017; Benmelech et al. 2018). Taken together, the weight of evidence suggests that we have moved from a labor market in the U.S. that was based on labor market negotiations via collective bargaining to one where employers increasingly have power to set wages subject to limited labor market discipline. Moreover, in the mid 20th century, collective bargaining likely served as a reference point for wage setting in the non-union sector. Erosion of these norms likely weakened pressures on non-union employers who, today, are freer to exercise their monopsony power. In other words, the weakening of labor market institutions and attendant norms that historically provided countervailing power can explain the extent and nature of real wage stagnation for most working Americans. In the era following the second world war, the key countervailing force in the U.S. labor market came from unions. Overall union membership reached a height of around 35 percent of the workforce in the mid 1950s. Unions affected wages both directly as well as indirectly through pattern bargaining as in the “Treaty of Detroit” (Levy and Temin, 2011). However, since then, union membership has steadily fallen, and stands at around 12 percent today (under 7 percent in the private sector). The impact of a falling union membership has been particularly acute due to the enterprise-level bargaining structure in the U.S. (and other countries like UK and Canada), which differs greatly from countries like France, Germany, Australia where collective bargaining coverage (share of jobs covered by collectively bargained contracts) is much greater than the union membership rates. 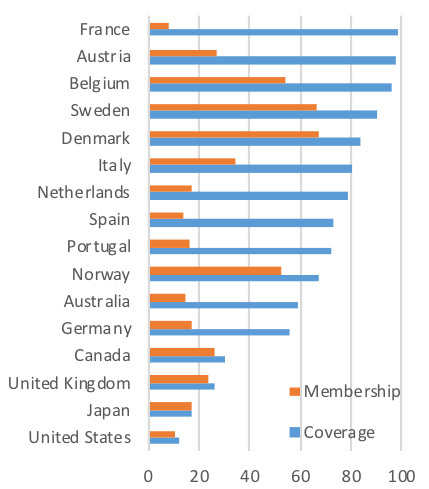 bargaining where membership and coverage rates have both fallen sharply (e.g., U.S.). Overall, this decline in union density has likely led to substantial reductions in wages in the middle of the distribution (Farber et al. 2018; see also Suresh Naidu’s chapter in this volume). In the U.S., efforts towards reversing the union decline have focused on making it easier to organize (e.g., Employee Free Choice Act). Suresh Naidu’s chapter in this volume discusses innovative strategies to ease the ability of workers to self-organize. Such changes would be valuable indeed. However, when starting from a 10% density (7% in private sector), even with greater organizing ease, it would take decades to rebuild union density back to anywhere near the post-war high water mark. In addition, enterprise level bargaining also incentivizes employer opposition; while sectoral bargaining means competitors are subject to the same wage bargain, enterprise level bargaining may put an individual employer at a greater competitive disadvantage. Finally, most of the efforts to reform labor law to make it easier to organize have failed in the political arena. In contrast, more success has come on the front of setting minimum wage standards, with state-level changes taking the lead. These policy successes have occurred while mainstream economics has engaged in a rethink about the costs and benefits of minimum wage policies fueled by credible empirical evidence, coupled with increasing theoretical understanding of search frictions and other sources of labor market power. In a comprehensive analysis, Cengiz et al. (2018) show that in the US, there is little evidence of either overall job loss or losses for lower skilled groups for minimum wages that are up to half the median wage for full time workers. This level of minimum wage is consistent with other OECD countries and US experience in the 1960s and 1970s. Recent “bolder” minimum wage experiments (e.g., California, Massachusetts, New York) have set forward a path to $15/minimum wage by 2023. Some of the “bolder” policies will lead to a substantially greater share of workers (>25%) whose wages will be directly or indirectly tied to the minimum wage, and will exceed the range of minimum-to-median wage ratios we have seen to date. Therefore, empirical evidence will need to assess whether these policies go “too far.” However, even if a national $15 minimum wage is found to be a beneficial policy, the minimum wage would have to be much higher to substantially move the median wage, requiring massive compression and possible risks (reduced hiring and business investment, increased price inflation). Obviously, there are serious limits to using a single policy lever to affect the entire wage distribution. One alternative to a single, high minimum wage involves instituting a wage board that sets multiple minimum pay standards by sector and occupation, potentially chosen using consultation with stakeholders, such as business and worker representatives and elected representatives (Andrias 2016, Madland 2018). The use of sector and occupation allows particular job types to have minimum pay standards. This would allow raising wages not just for those at the very bottom, but also for those at the middle. For example, janitors working for building services contractors are typically paid fairly low wages. However, the pay ranges are typically above statutory minimum wages, and over 90% of workers in this sector make above the federal minimum wage. This means the minimum wage is not a particularly effective tool to raise pay in this sector. The wage board approach can better reach such low (but not the lowest) rungs of the pay scale. This is effectively done in countries where there are extensions of collective bargaining contracts, but can also be done by setting multiple minimum pay levels statutorily. An example of a wage board approach comes from Australia, which has a combination of 1) national minimum wage, 2) the “Modern Awards” system of industry and occupation-specific minimums, 3) enterprise-level collective bargaining. Around 36% of the workforce is covered by collective bargaining contracts, but another 23% are covered by awards only. The awards are set by a federal tribunal whose members are appointed by the government to serve until the age of 65. Most of these are by industry, although some (e.g., nurses or pilots) are by occupation. There are 122 such awards, and within each there are a host of wage rates based on skill-requirements or experience; there may be anywhere between a handful to several dozen pay grades specified in each agreement. As a practical matter, the annual wage increases are largely similar each year for most awards and pay grades. For example, in 2018, most Modern Award pay standards were increased by 3.5% in low-wage sectors like Retail or Hospitality, the same amount as the baseline minimum wage increase. In some years or particular cases, there may be some additional adjustment to wages to further boost pay in the lowest categories of work to achieve greater pay compression. While it is difficult to definitively assess the impact of the Australian system of labor standards, broad metrics offer a positive verdict. Household inequality in Australia is more muted as compared to the U.S. with a 90/10 ratio of 4.3 instead of 6.3 according to most recent data from the OECD. 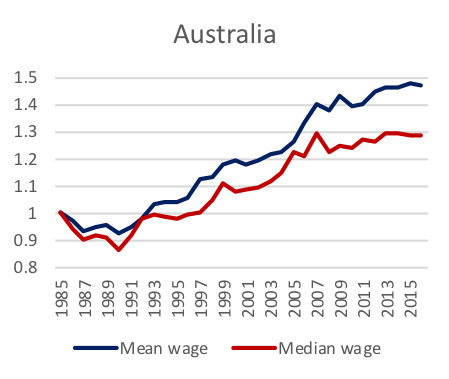 Importantly, as shown in Figure 3 below, the median wage has kept up with the mean wage in Australia much more than in the US, where the median has stagnated since the 1980s. This evidence is consistent with the view that labor market institutions like the Modern Awards system helped ensure broad based prosperity and ameliorating the growth in wage inequality in Australia, when compared to the US benchmark of de-unionization and erosion of wage standards. Source: OECD Stats. Notes: wages are PPP-adjusted real wages, indexed to 1985 value. At the same time, the more muted growth in inequality is not associated with any obvious differences in labor market performance. While the current unemployment rate in Australia is 5.3% as opposed to 3.9% in the US, averaged over the past 10 years, the respective figures are 5.5% in Australia and 6.9% in the US. Moreover, focusing on younger or lower skilled workers does not yield very different comparisons. Overall, the Australian evidence is broadly consistent with the perspective that judiciously applied wage setting using a wage board system can help ameliorate wage inequality without causing any serious harm to the labor market. In order to institute wage boards at the national level in the U.S., federal law would need to be changed. However, at the state level, at least 5 states (Arizona, Colorado, California, New Jersey, and New York) already have legislation on the books that allows for constituting wage boards by industry or occupations. At the same time, these boards have been used infrequently. Most prominently, they were used to raise the overall minimum wages in California in the 1990s, and more recently to establish a fast food minimum wage in New York. 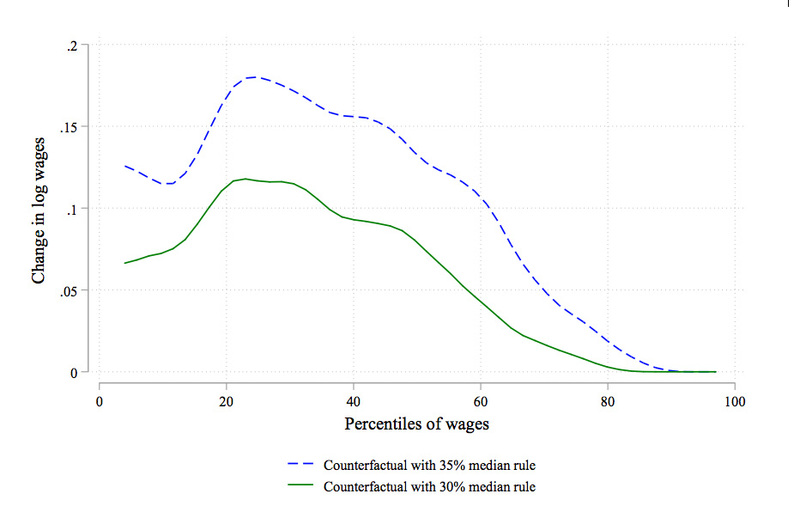 However, there been little effort to use the wage board mechanism to target wages for the middle of the distribution. At the same time, the machinery is in place to push for a broader array of wage standards. State experimentation with wage boards to set standards higher up in the wage distribution—as in the Australian case—could play a possibly useful role in mitigating wage stagnation and inequality. Moreover, other states can follow suit and establish similar wage board legislation to those in place in California. While details can vary, a wage board system would set minimum pay standards by sector and occupation. This allows the mechanism to affect the distribution of wages not just at the very bottom but additionally toward the middle of the distribution. As an illustration, I simulate the effect of a wage board by imposing region-by-industry-by-occupation standards, separately calculated by region (specifically 9 census divisions), 17 two-digit industries, and 6 occupational groups producing a total of 102 wage standards. The choice of standards is of course a key issue: to show how this may affect wage inequality, I consider two standards: in the first (“low”) I set the minimum to 30% of the median wage in each of the 102 categories in that particular Census division, while in the second (“high”) I set it to 35% of the median. While as a share of the median wage these two standards seem not to be very far apart, they do imply quite different bites for the policy, as I show below. As a starting point, the wage standards would be binding for 20% and 31% of workers under the low and high scenarios, respectively. In other words, the low and the high scenarios straddle the Australian case—where around 23% of workers’ wages are set by the modern award system. However, Australia also has a substantially higher set of workers with collectively bargained wages (36%) than in the US (12%). Therefore, the “high scenario” would still imply a smaller same set of workers who are covered by either collective bargaining or by a wage board as in Australia. As shown in Figure 4, overall, both the high and low scenarios imply substantial wage gains, especially for the bottom and middle of the wage distribution. 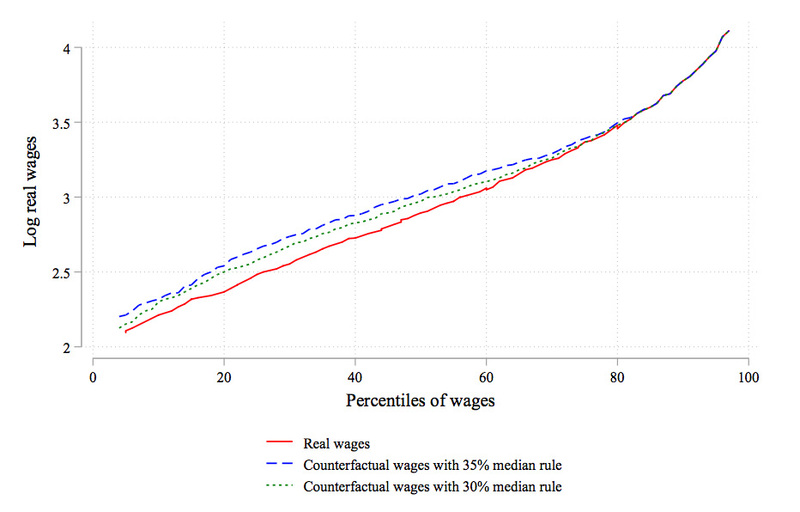 Under the low scenario, the 20th, 40th and 60th percentile wage rises by 13, 9 and 4 percent, respectively. When we consider the higher scenario the wage gains extend somewhat further: wages at the same percentiles would rise by 19, 15 and 12 percent, respectively. It is useful to contrast these distributional impact of wage boards with those from typical minimum wage increases in the U.S, which mostly fade out by the 20th percentile of the wage distribution. In other words, wage boards are much better positioned to deliver gains to middle-wage jobs than a single minimum pay standard. Of course, these calculations are illustrative and make many simplifying assumptions such as ruling out additional spillover effects, changes in composition of jobs, to name a few. However, what they show is that a suitably chosen wage standard can substantially raise middle and bottom wages and lower wage inequality. If a wage board system leads to substantial increases in wages, it is reasonable to be concerned about possible unintended consequences. It is important to acknowledge all experimentation involves unknowns, especially when it involves substantial changes to the wage structure. Two natural sources of concern would be price increases and impact on jobs. This suggests it is useful to structure any changes incrementally, giving us enough time to learn from the experiments. What could such steps look like? First, it might be useful to pilot wage boards for some specific sectors, ideally ones which would be well targeted to moving wages towards the bottom and middle of the distribution. Second, when taking the wage board to scale (i.e., applying to a broad set of sectors), it makes sense to make pay increases gradual, preventing any sharp increases. Especially when it comes to the national level, broad based wage increases can affect aggregate demand, as well as price inflation which is closely monitored by the Federal Reserve. A full-fledged wage board system works best when the monetary and wage board authorities work in partnership to maintain stable wage and price growth with periodic adjustment to wage compression. The experience in Australia, as well as many countries with national-level sectoral bargaining, suggests this is feasible. Of course, having the mechanism in place is not a guarantee that it will be effective. At the same time, we need more arrows in our quiver to tackle income inequality and wage stagnation. And wage boards may well be one of those. Andrias, Kate. 2016. “The New Labor Law,” The Yale Law Journal 126(1): 1–261. Autor, David, Alan Manning, and Christopher Smith. 2016. “The contribution of the minimum wage to US wage inequality over three decades: a reassessment.” American Economic Journal: Applied 8(1), 58-99. Azar, José, Ioana Marinescu, and Marshall I. Steinbaum. 2017. 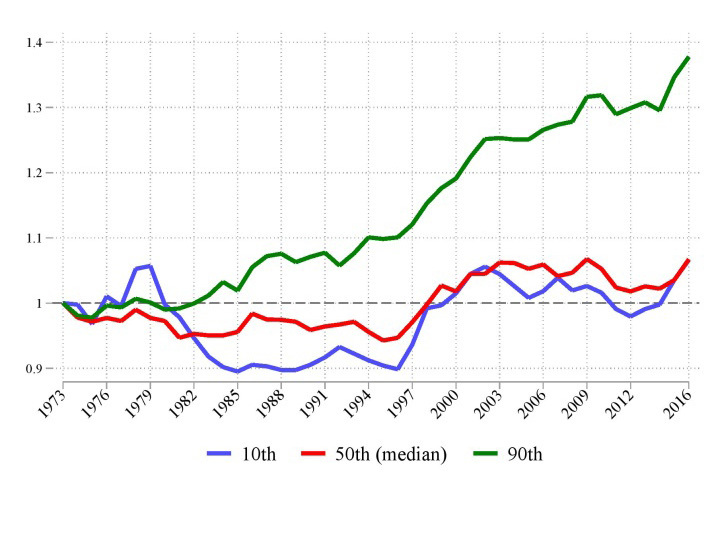 “Labor market concentration.” National Bureau of Economic Research Working Paper No. w24147. Benmelech, Efraim, Nittai Bergman, and Hyunseob Kim. 2018 “Strong employers and weak employees: How does employer concentration affect wages?” National Bureau of Economic Research Working Paper No. w24307. Card, David, Jörg Heining, and Patrick Kline. 2013. “Workplace heterogeneity and the rise of West German wage inequality.” The Quarterly journal of economics 128(3): 967-1015. Cauldwell, Sydnee and Emily Oehlsen. 2018. “Monopsony and the Gender Wage Gap: Experimental Evidence from the Gig Economy.” Working paper. Cengiz, Doruk, Arindrajit Dube, Attila Lindner, and Ben Zipperer. 2018. “The Effect of Minimum Wages on Low-Wage Jobs: Evidence from the United States Using a Bunching Estimator.” CEP Discussion Paper No 1531. Dube, Arindrajit, Jeff Jacobs, Suresh Naidu, and Siddharth Suri. 2018. “Monopsony in Online Labor Markets.” American Economic Review Insights (forthcoming). Dube, Arindrajit, Laura Giuliano, and Jonathan Leonard. 2018. “Fairness and frictions: The impact of unequal raises on quit behavior.” American Economic Review (forthcoming). Farber, Henry S., Daniel Herbst, Ilyana Kuziemko, and Suresh Naidu. 2018. “Unions and Inequality Over the Twentieth Century: New Evidence from Survey Data.” National Bureau of Economic Research Working Paper No. w24587. Levy, Frank and Peter Temin. 2011. “Inequality and Insti- tutions in 20th Century America.” Pp. 357–86 in Eco- nomic Evolution and Revolution in Historical Time, edited by J. Rosenbloom, P. Rhode, and D. Weiman. Palo Alto, CA: Stanford University Press. Manning, Alan. 2003. Monopsony in Mothion. Princeton University Press. Song, Jae, David J. Price, Fatih Guvenen, Nicholas Bloom, and Till Von Wachter. 2018. “Firming up inequality.” Quarterly Journal of Economics (forthcoming).